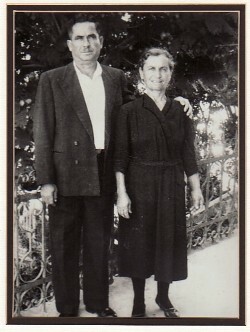 Above: My parents, Filipas and Irini. 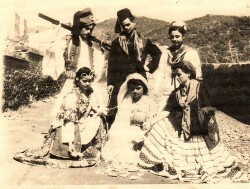 Above Right: Dressed in traditional salvaria for Apokries Carnavale. Above: In a school play for Indepedence Day celebrations. In the top are Mihalis Asmanis, unknown, and myself, while in the front row are unknown, Marika Gaitani and Persa. Above Right: Family and horianoi. 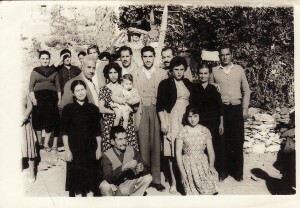 L-R: Papadoula Vounatsou, my father-in-law, Sarandos Ikonomou, Aspasia-holding Ioannis- and Efstratios Merkoutis, my husband, Dimitrios, my uncle, Simos Gaitanos, myself, my mother, Irini, and my father, Filipas. 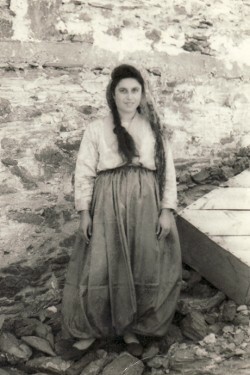 In the front is Marika Gaitanis.